Heat oven to 425°F. Spray cookie sheet, or line with silicone baking mat. 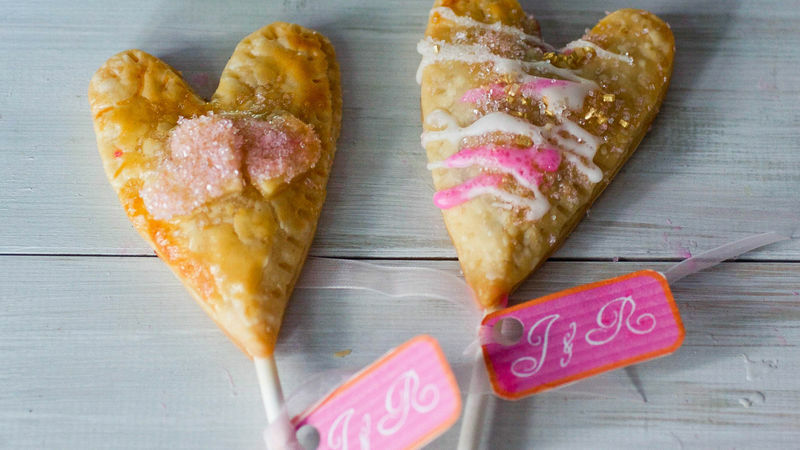 To make each pie pop, lightly press lollipop stick into heart so that it rests in center. Top each round with 1/2 teaspoon lemon curd and a few baking chips. Repeat cutting out hearts with other pie crust; cover each with second heart crust. With fork or lollipop stick, press around edges to seal. Brush tops of pops with beaten egg; sprinkle with granulated sugar. If desired, cut out small hearts from dough scraps and place on top. Bake about 15 minutes or until golden brown. Remove from cookie sheets; cool completely on cooling racks. Mix powdered sugar and milk to form a thin frosting. Place in pastry bag or decorating tube, and zigzag over top of each for decorative finish. Wrap each pop in a small plastic bag, and tie with ribbon. Use canned pie filling instead of lemon curd, if desired.